Bombardment-attack from D1 to UK3,attack from D6 to UK1,attack from W1 to UK2. 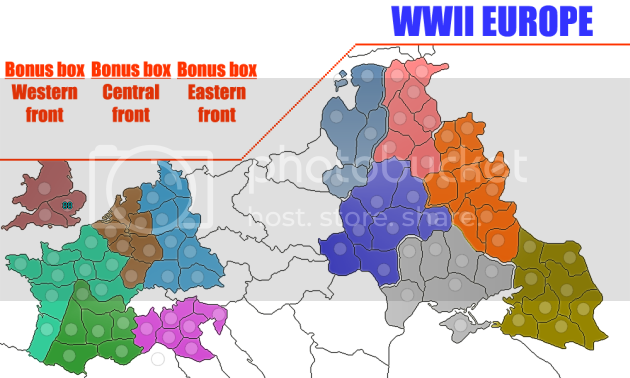 Like i say before,i will try to create WWII EUROPE colecting two mine map-WWII EASTERN FRONT and WWII WESTERN FRONT together with third part WWII CENTER FRONT. Last edited by oaktown on Tue Mar 10, 2009 6:26 pm, edited 62 times in total. it is 1000px wide and already some terits are very squished. if you reduce it even more it will look like crap. I say he does it anyway. I print out most of the maps and resize them for playing IRL, I don't really care if it makes the site or not. If the moderators here have a problem with that maybe they can suggest where in the forums he could do this if not in the conceptual section of the map development forums. Yes big problem is size,i will try to put size down,but to put size to be 640px will be very dificulty to read,or to put circle in terittory. Maybe at some point in the near future, BOB will become an official part of CC. I say this because of its severe importance to a minority of players. Those who are colourblind cannot play without it. And, many others who are not depend on it as well. Anyway, possibly for a few extreme cases, some maps will not have to put the names of territories onto the map. Instead, the XML and BOB would allow highlighting of the territory to see its name. After a few games or perhaps in the first game, players would learn the names so as not to have to depend on it totally, but will still have it at their use. Yes it might be slightly cumbersome, but if it allows cartographers to make a map that could not usually be made because of the size limits (which makes putting army circles and names whilst keeping it clear and good looking difficult if not impossible for some maps) then I say it should at least be considered. I'm not saying every map should be allowed this freedom, but it's just an idea so if it allows us to get more maps then I say why not. Some maps have great potential and we should try to use all the tools available to help them become part of CC. qwert wrote: Yes big problem is size,i will try to put size down,but to put size to be 640px will be very dificulty to read,or to put circle in terittory. here's a resize for the small at 630 width. look at the terits. you have no place for names and army circles. 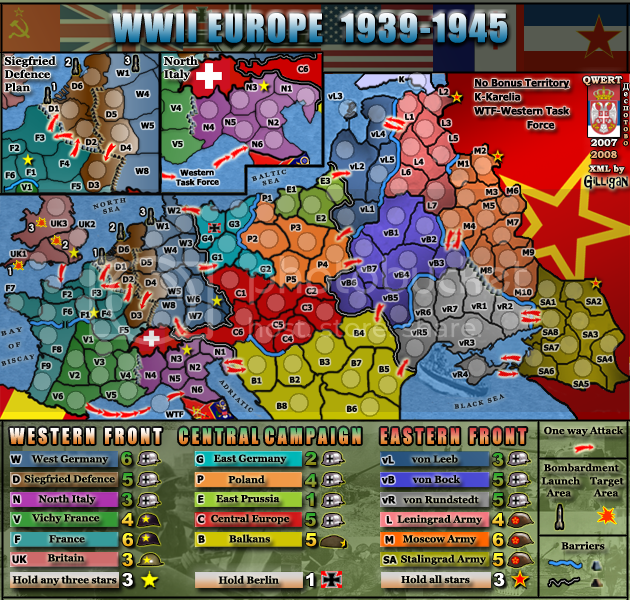 i say you should go ahead and do just the central front and wait a little more to do this map perhaps some future changes (like increase in map size or clickable maps) will allow it to be good. at this point unfortunatelly it is impossible. If you're not going to use all that space in Russia, perhaps rotate the map slightly and crop the image. That should allow you to make the actual playable map bigger. Make sure Britain is attackable in this version. I dont sure what you mean? Strange,i create font to be more readable then World 2.1.because hes font is even smaler then these font. 2. to make us all realize how really big is world 2.1 and how other maps should be allowed to be bigger. KEYOGI wrote: If you're not going to use all that space in Russia, perhaps rotate the map slightly and crop the image. That should allow you to make the actual playable map bigger. Perhaps one of you could demonstrate how best to do that without screwing up the whole map. Well i dont like these,but i rotate map,and resize to 800x600,but still i dont get to map be biger. Coleman if you dont notice,when i put dimension of font ,i look small map of world 2.1,if i create map with these world 2.1 dimension,then mine font will be biger. for real. we already have a map thats 'against the rules' and no one seems to have a problem with it. i mean the players that is. I complete agree with you mibi,if some map people like then Andy must find some solution for these,now its look that rules only not count for world 2.1,but people like these map,also i can not create these map to be smaler then now. I agree also there trying to fix something that isn't broken. I have never heard anyone complain about the map sizes, EVER. I agree also...Have said this in DIM's map thread as well. Just a point to note mibi and coleman. Your Supermax prison map does not meet the size guide lines either!! !